The arms of early men were forged in the Abyss, and betray a smidgen of life. For this reason the gods cast a seal of fire upon these swords, and those who possessed them. The knights wield swords, spears, and greatswords. This shield, as hard as a great boulder, is formed by the head of the descendant of an Archdragon. 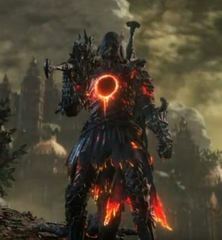 The Ringed Knights, by command of the gods, stood amongst the ranks who set out to slay the dragons, but their contributions were never lauded. Straight sword wielded by the Ringed Knights. The arms of early men were forged in the Abyss, and betray a smidgen of life. For this reason the gods cast a seal of fire upon these swords, and those who possessed them. 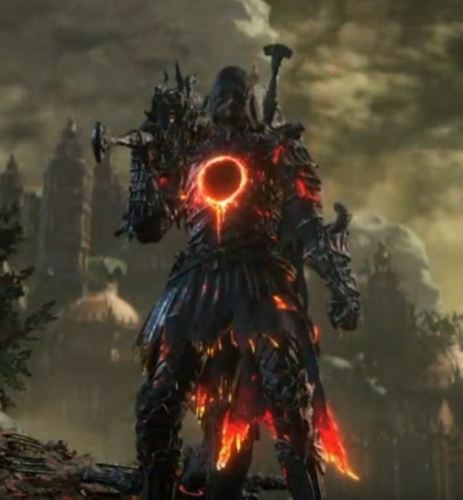 Paired black greatswords wielded by the Ringed Knights. The arms of early men were forged in the Abyss, and betray a smidgen of life. For this the gods cast a seal of fire upon such weapons, and those who possessed them.